Not to be confused with Echo Chamber. Anechoic chambers, a term coined by American acoustics expert Leo Beranek, were initially exclusively used to refer to acoustic anechoic chambers. Recently, the term has been extended to RF anechoic chambers, which eliminate reflection and external noise caused by electromagnetic waves. Minimization of the reflection of sound waves by an anechoic chamber's walls. Anechoic chambers are commonly used in acoustics to conduct experiments in nominally "free field" conditions, free-field meaning that there are no reflected signals. All sound energy will be traveling away from the source with almost none reflected back. Common anechoic chamber experiments include measuring the transfer function of a loudspeaker or the directivity of noise radiation from industrial machinery. In general, the interior of an anechoic chamber is very quiet, with typical noise levels in the 10–20 dBA range. In 2005, the best anechoic chamber measured at −9.4 dBA. In 2015, an anechoic chamber on the campus of Microsoft broke the world record with a measurement of −20.6 dBA. The human ear can typically detect sounds above 0 dBA, so a human in such a chamber would perceive the surroundings as devoid of sound. Anecdotally, some people may not like such quietness and can become disoriented. The mechanism by which anechoic chambers minimize the reflection of sound waves impinging onto their walls is as follows: In the included figure, an incident sound wave I is about to impinge onto a wall of an anechoic chamber. This wall is composed of a series of wedges W with height H. After the impingement, the incident wave I is reflected as a series of waves R which in turn "bounce up-and-down" in the gap of air A (bounded by dotted lines) between the wedges W. Such bouncing may produce (at least temporarily) a standing wave pattern in A. During this process, the acoustic energy of the waves R gets dissipated via the air's molecular viscosity, in particular near the corner C. In addition, with the use of foam materials to fabricate the wedges, another dissipation mechanism happens during the wave/wall interactions. As a result, the component of the reflected waves R along the direction of I that escapes the gaps A (and goes back to the source of sound), denoted R', is notably reduced. Even though this explanation is two-dimensional, it is representative and applicable to the actual three-dimensional wedge structures used in anechoic chambers. Full anechoic chambers aim to absorb energy in all directions. Semi-anechoic chambers have a solid floor that acts as a work surface for supporting heavy items, such as cars, washing machines, or industrial machinery, rather than the mesh floor grille over absorbent tiles found in full anechoic chambers. This floor is damped and floating on absorbent buffers to isolate it from outside vibration or electromagnetic signals. Recording studios are often semi-anechoic. An F-16 Fighting Falcon in the anechoic test chamber at Eglin Air Force Base. The internal appearance of the radio frequency (RF) anechoic chamber is sometimes similar to that of an acoustic anechoic chamber; however, the interior surfaces of the RF anechoic chamber are covered with radiation absorbent material (RAM) instead of acoustically absorbent material. Uses for RF anechoic chambers include testing antennae, radars, and is typically used to house the antennas for performing measurements of antenna radiation patterns, electromagnetic interference. Performance expectations (gain, efficiency, pattern characteristics, etc.) constitute primary challenges in designing stand alone or embedded antennae. Designs are becoming ever more complex with a single device incorporating multiple technologies such as cellular, WiFi, Bluetooth, LTE, MIMO, RFID and GPS. RAM is designed and shaped to absorb incident RF radiation (also known as non-ionising radiation) as effectively as possible, from as many incident directions as possible. The more effective the RAM, the lower the resulting level of reflected RF radiation. Many measurements in electromagnetic compatibility (EMC) and antenna radiation patterns require that spurious signals arising from the test setup, including reflections, are negligible to avoid the risk of causing measurement errors and ambiguities. is the free space wavelength. Accordingly, increasing the pyramid height of the RAM for the same (square) base size improves the effectiveness of the chamber at low frequencies but results in increased cost and a reduced unobstructed working volume that is available inside a chamber of defined size. An RF anechoic chamber is usually built into a screened room, designed using the Faraday cage principle. 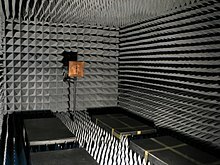 This is because most of the RF tests that require an anechoic chamber to minimize reflections from the inner surfaces also require the properties of a screened room to attenuate unwanted signals penetrating inwards and causing interference to the equipment under test and prevent leakage from tests penetrating outside. At lower radiated frequencies, far-field measurement can require a large and expensive chamber. Sometimes, for example for radar cross-section measurements, it is possible to scale down the object under test and reduce the chamber size, provided that the wavelength of the test frequency is scaled down in direct proportion by testing at a higher frequency. RF anechoic chambers are normally designed to meet the electrical requirements of one or more accredited standards. For example, the aircraft industry may test equipment for aircraft according to company specifications or military specifications such as MIL-STD 461E. Once built, acceptance tests are performed during commissioning to verify that the standard(s) are in fact met. Provided they are, a certificate will be issued to that effect. The chamber will need to be periodically retested. Test and supporting equipment configurations to be used within anechoic chambers must expose as few metallic (conductive) surfaces as possible, as these risk causing unwanted reflections. Often this is achieved by using non-conductive plastic or wooden structures for supporting the equipment under test. Where metallic surfaces are unavoidable, they may be covered with pieces of RAM after setting up to minimize such reflection as far as possible. A careful assessment may be required as to whether the test equipment (as opposed to the equipment under test) should be placed inside or outside the chamber. Typically most of it is located in a separate screened room attached to the main test chamber, in order to shield it from both external interference and from the radiation within the chamber. Mains power and test signal cabling into the test chamber require high quality filtering. Fiber optic cables are sometimes used for the signal cabling, as they are immune to ordinary RFI and also cause little reflection inside the chamber. Personnel are not normally permitted inside the chamber during a measurement as this not only can cause unwanted reflections from the human body but may also be a radiation hazard to the personnel concerned if tests are being performed at high RF powers. Such risks are from RF or non-ionizing radiation and not from the higher energy ionizing radiation. As RAM is highly absorptive of RF radiation, incident radiation will generate heat within the RAM. If this cannot be dissipated adequately there is a risk that hot spots may develop and the RAM temperature may rise to the point of combustion. This can be a risk if a transmitting antenna inadvertently gets too close to the RAM. Even for quite modest transmitting power levels, high gain antennas can concentrate the power sufficiently to cause high power flux near their apertures. Although recently manufactured RAM is normally treated with a fire retardant to reduce such risks, they are difficult to completely eliminate. Safety regulations normally require the installation of a gaseous fire suppression system including smoke detectors. ^ a b Morton, Ella (5 May 2014). "How Long Could You Endure the World's Quietest Place?". Slate. Retrieved 5 May 2014. ^ Novet, Jordan (1 October 2015). "Look Inside Microsoft's Anechoic Chamber, Officially the Quietest Place on Earth". VentureBeat. Retrieved 1 October 2015. ^ Beranek, Leo (10 August 2009). Written at Boston. "Oral History Interview with Leo Beranek" (Interview). Interviewed by Richard Lyon. College Park, MD: Niels Bohr Library & Archives, American Institute of Physics. Retrieved 8 December 2014. ^ Randall, R. H. (2005). An Introduction to Acoustics. Dover Publications. Wikimedia Commons has media related to Shielding rooms.